1) CONTAINER WEIGHT - Fixed a bug where containers did not show their total weight. 2) RUNE LOCK ATTEMPTS - Fixed "exploit" check. Could be reset with two consecutive rests. 3) TREASURE ITEM DECAY - Fixed a decay time that was decaying much too quickly. 5) COMPANION AI - Created PCs had the wrong On Perception script attached. 1) Added "Gather Party" facility to help get around path-finding issues. 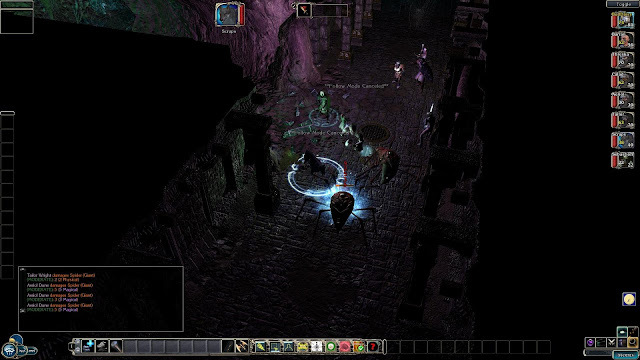 (*) NOTE: Rather than pause immediately on any encounter (with this setting), I found that simply having the PCs "stand their ground" until the creature actually attacked was the better solution. 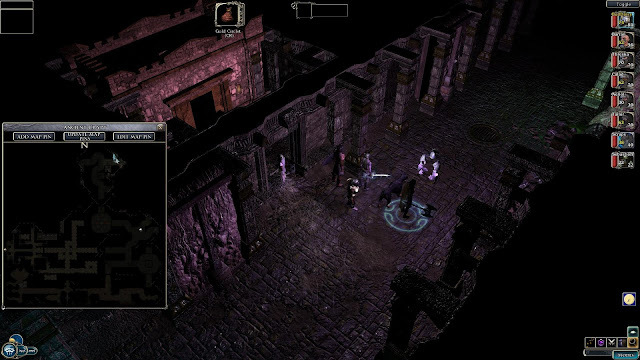 Otherwise, PCs could potentially "pause" the game even before the creature was able to be targeted by the player. The player can still manually pause (before the automatic pause) if they want to, of course. CURRENT PLAY TIME: 37 hours and 40 minutes.